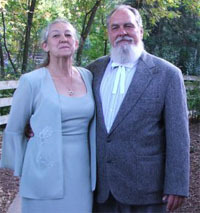 Scott and Theresa Johnson lived in Seymour Tennessee, nestled in the hills of the Smokey Mountains. In 2000 the Johnsons arrived in Israel to do volunteer work for the ICEJ. Scott was head of the logistics department for almost four years. This position allowed him a lot of contact with the Israeli public, vendors, contractors, even some military personnel. He did everything, from maintenance, moving personnel, to building the sets used for the ICEJ Feast of Tabernacle celebration. From there he went on to volunteer for JSC, for four years, where his duties involved working with even more Israeli’s, especially Lone Soldiers and New Immigrants. As for Theresa, she did five years of volunteer service with the ICEJ where she headed up the costume department; making 1000’s of garments for the Feast of Tabernacles celebration the ICEJ sponsors each year during Succoth. During these very important years they were making relationships with the Israeli people becoming acclimated into Israeli culture. The Johnsons were gaining a real love for the people in the land, The Lord's Festivals "Leviticus 23: 1,2" and their Holidays. It started slowly, with the implementing of Shabbat into their lives; preparing themselves, their home, cooking something special, and enjoying the festive meals with friends and those who had nowhere to go. As time moved onward this became an essential part of the Johnson's lifestyle and as the years progressed they had greater opportunities to welcome more people into their home who had no place to spend Shabbat. So, with the love that had grown in them for the people and the culture of Israel, it was a natural progression moving from being someone’s’ volunteer to opening their home regularly for people to come and join them for a Shabbat experience. It has now progressed into being their life’s work. What started as an occasional visitor sharing a meal has turned into like a full time job feeding and sheltering the lonely. In 2005, they started by opening their home on Erv Shabbat inviting the lonely whom had no place to go for the Festive meals. Since that time their home “Ha Miflaht” has steadily grown to serving over 5,500 meals a year to the Lonely Soldiers and New Immigrants. And as places the whole world over seem to be experiencing hardship they have every reason to believe that 2017 will see even more Lonely Soldiers and New Immigrants come through their doors. how do does one donate by mail? Servants To Christ is a 501c3 in the USA. All your donation will be sent to HaMiflaht to help the Lone Soldiers in Israel. I’ll send you a password in a email were always grateful to have new donors…Thank you and God Bless. Hello, we are from Seattle, WA and would like to donate on a regular basis. Please send a password to log onto your donation page. Our close friend Ann Harris informed us about your place. Our friend Ann will be arriving this coming week to visit your home on the 16th of January. We are excited to help. Theresa and I run HaMiflaht a Home where Lone Soldiers and New Immigrates can come to have an Erev Shabbat meal. Last year we served over 4,500 meals this year we will sever well over that figure. This year 2014 we have had a large influx of new Lone Soldiers. For the last six months we have had Soldiers almost seven days a week. In the last six weeks we have had at least five Soldiers staying in the Home 24/7. A week before Operation Protective Edge started we’ve had sixty to seventy Soldiers throughout the week. We provide clean beds for them to sleep in, hot meals for them to eat and a family atmosphere where they can relax. All are involved in the war one way or another and we try to comfort them, encourage them, and help them keep their morale up. The biggest thing we do for them, is just LOVE them and let them know their LOVED by others. Since Operation Protective Edge we have Soldiers that get thirty six to forty eight hours off every four or five days, HaMiflaht is closer than most of their bases, it can take 4 to 6 hours to reach their base and they can reach HaMiflaht in 2 to 2 ½ hours. They come lonely, hungry and have a pile of laundry that needs cleaned. As you might imagine our food bill and utilities have quadrupled in the last two months. We would appreciate your prayers for the Lone Soldiers and HaMiflaht. If you would like to Bless the Israeli Soldiers with a donation for food and supplies please email me at scott.j@hamiflaht.org and I will send you a password to log on to our donation page. Thank you for your Ministry to the Jewish People. By teaching the word of Jesus you will help bring about world peace. We don’t preach or teach the word from the Gospel to the Jewish people. But we do try and show His Love and imitate His way of life. GLC and HaMiflaht have partnered together to help support the Lone Soldiers here in Jerusalem. Please send me an email through the contacts page and we can discuss how you would like to help.